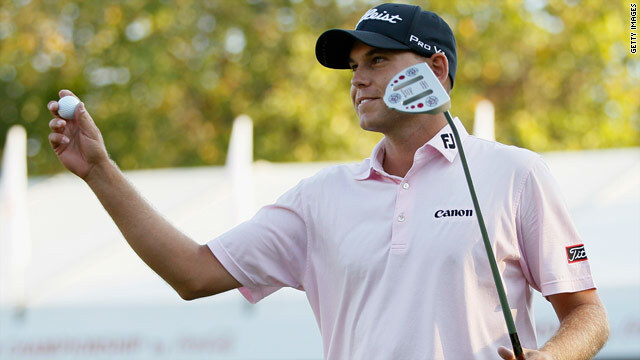 Bill Haas beat fellow American Hunter Mahan in a playoff to win both the Tour Championship and FedEx Cup. When Northern Irishman Darren Clarke deservedly won this year's British Open, the spotlight once again fell on America's under-achieving stars. With Tiger Woods winless in majors since June 2008 and Phil Mickelson's last grand slam title coming in April 2010, the pressure on this current generation of U.S. players was immense going into last month's PGA Championship and the PGA Tour's big-money end-of-season series in September. But I have to say they've risen to the challenge in highly-impressive fashion. Keegan Bradley started the ball rolling by claiming his first major title, and Bill Haas has topped it off by winning the deciding Tour Championship and the $10 million FedEx Cup jackpot on Sunday. Haas is the latest American in his twenties to prove he's got what it takes when under the most extreme pressure. His coolness when the heat was on during his dramatic playoff victory in Atlanta had to be witnessed first-hand to be believed. He needed three extra holes before he finally saw off the challenge of U.S. Ryder Cup star Hunter Mahan to win the staggering amount of $11.44 million - his reward for four impeccable rounds in the 60s, which made him the fourth different winner in the five-year history of the highly-lucrative series. The line-up for the tournament at East Lake saw an elite field of the 30 players who'd qualified. Among them were three from Europe, including two Brits. Sadly for Justin Rose, who went into the final event third in the standings, he failed to build on his excellent success the previous week in Chicago. But what of world number one Luke Donald, the Englishman who badly needs a major under his belt? I spoke with Luke at the start of the week. He was one of the top-five players in the points standings and therefore able to control his own destiny. There's no doubt Donald is a formidable model of consistency when playing in the U.S. He now has 13 top-10 finishes in 18 starts on the PGA Tour and, while he again had a good few days here, for the second straight year at this event he fell short in the heat of battle as he tied for third. For his legions of fans, there must be concerns as to why the Englishman can't go on and close out the win from the positions of strength into which he routinely gets himself. There's no question in my mind that American players on their own tour in their own backyard remain very hard to beat. Look at Jim Furyk last year. He too held off Donald, and this time we saw Mahan and Haas doing the same. Bradley's achievement of winning his first major at his first appearance, in his mid-twenties, was incredible. He too had an impressive showing at East Lake and led after round one before falling back a little. Bradley has proved himself already, though, at the highest level and is clearly one to watch moving forward. Team USA will soon fly off Down Under to compete in this year's Presidents Cup in Australia. Confidence is sure to be high ahead of the clash with the Internationals in Melbourne. The likes of Bradley and now Haas have given their country a huge boost at a time it was badly needed and I, for one, can't wait for next year's Ryder Cup on U.S soil. A bit early to draw that conclusion, isn't it? Rickie Fowler will be a factor too in coming months for sure! The top three players in the world are all European and there's not a hint of anybody catching them. Rory McIroy, once again another top 5 postion to add to his last two tournaments. Its hardly shocking that an Amercian won the Fedex cup seeming that the vast majority of the tour is made up of Americans. Three out of the 4 majors this year were won by international players and only 1 american has won a major in the last 8! !